Do you know how to make an impact? How to get heard? How to have your ideas shared with the world and have an impact? 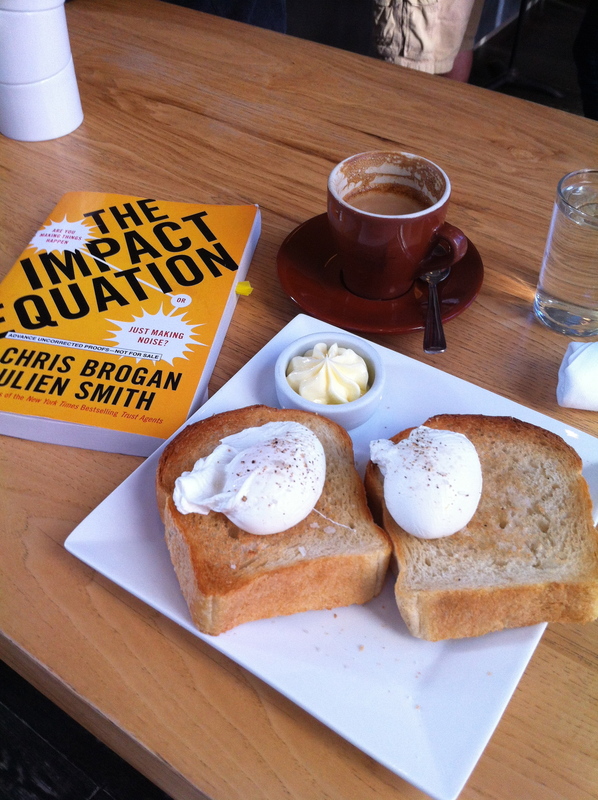 My friend Chris Brogan along with his co-author Julien Smith have a new book, The Impact Equation: Are You Making Things Happen or Just Making Noise?, which will be published on Oct 25th, 2012. They sent me a preview copy and over the past couple of weeks I have been reading it at cafes and on the muni here in San Francisco. My copy is already dog eared and flagged with post-its for easy reference back to key points in the book. First a few disclosures and admissions. One, Chris Brogan is a friend – not an old “grew up” with friend, but not just someone whom I follow on social media channels, he’s someone whom I have met in person many times and whom I knew years ago before he had books published and a speaking schedule that takes him around the world. Two, I haven’t (yet) read Trust Agents which is Chris and Julien’s earlier book. My stack of books to be read – for fun and for business including far too many by folks I know has been large and growing over the past few years and somehow I haven’t gotten to Trust Agents yet. Three, many of the people they write about in this new book (and I suspect in their previous book) are people I know friends from here in San Francisco and from the larger tech/social media/blog/podcasting world. Four, I don’t have the 1000’s of readers/followers/listeners of folks like Chris and Julien but I am as they say “a degree away” from many people who do – folks with millions of followers and a high impact on the world. With all of that disclosed up front I have been inspired not just to write this review but to rethink a bunch of my personal projects (including this blog) and over the next few weeks and months I anticipate making many personal and professional changes inspired in no small part by the ideas of The Impact Equation. I can’t summarize their book in a few short paragraphs but I will summarize a few of their early and key points and discuss how I plan on addressing them. Yes, that is, not surprisingly, the simple yet key fact that to have impact now (and in the past) you have to create – frequently, often and well. The full equation defines each part and the book illustrates each aspect of the equation. Contrast – a new idea has to familiar yet different enough to be noticed. Reach – the number of people you can get connected to your ideas. Exposure – how often do you connect with the people you can reach. Articulation – being understood and clear in communicating your idea. Trust – the subject of their previous book but still not entirely figured out – but why will people listen to you? And finally Echo – the feeling of connection that great ideas and impactful people create. Fairly simple, fairly memorable yet also complex enough to warrant a full book (and I’m sure many more talks and presentations in the future for Chris and Julien). On a person level my biggest takeaways from the book is a reminder to get myself back into the ongoing, frequent content creation business – that if I want to grow my own personal impact I need to create more content, more often, and more thoughtfully. Furthermore I need to think about this whether I’m going to continue being an independent consultant or if I join a larger organization. That while I may have some impact in my tweets, comments, email list participation and even events that I create if I were more thoughtful about my online (and offline) activities I could have a much greater impact on the world. With more thoughtful (and literally more frequent) effort I can have a far larger impact on the world than i do today. That I can take the conversations I have one-on-one today and still have that impact but also bring it to a far wider audience. For some of this I will have to get out of my comfort zone – write more content, experiment with new formats for myself (video? audio?) and generate this content far more frequently than I have been for the past few years. In each of the chapters of The Impact Equation Chris and Julien cover a mix of specific tactics (and the occasional exercise to get you thinking) as well as stories that illustrate their key ideas. Some of these stories are from business people they have met others are illustrated with celebrities they admire. But in every chapter they also focus on asking you to think about how this applies to yourself – how would you evaluate yourself on this dimension of their equation. I think most of these chapters and the book over all are compelling but not every chapter is equally strong. The initial chapters on Ideas – on Contrast and Articulation are very good and have a lot of useful exercises for everyone. In particular they have a lot of great exercises around how to evaluate your own ideas and how to communicate them clearly. The middle chapters on Platforms – on Reach and Exposure – however are a bit weaker. In particular I think the chapter on Exposure is the weakest chapter in the book. In part this is because Exposure is in no small part outside of your direct control. They talk in this chapter about the exposure that someone like Jimmy Fallon has from his tv show but they also talk about the impact of frequency on your exposure but the links and what will work best for most people is not entirely clear from this chapter (and it is perhaps not an easy thing to answer). They have a lot of great questions and a few answers but this chapter left me a bit unsatisfied. Yes, participating in the communities you want to reach is great advice (it is what I tell my clients in fact) but it takes more than just that to get great exposure of your ideas. The final chapters on Network – on Trust and Echo, Echo – are perhaps surprisingly among the shortest in the book. The chapter on Trust is a revisit (per what they wrote, I haven’t yet read Trust Agents) of the topic of their earlier collaboration. The chapter on Echo (Echo, Echo) is nearly the end of the book and very important but also fairly short. It is about how your ideas resonant and connect. Very important but I think if they could have gone a bit deeper here the whole book would have “echoed” for me even more strongly. But that said they make some really important points in this last chapter leading to the conclusion of the book. Overall as I said above my recommendation is that you go out and buy this book – in fact that you go preorder it now to be among the first to read it. I hope for my friend’s sake that it is a huge hit and given the quality of the content I’m sure it will be a successful book. More importantly on a personal front it has many parts that I will be using myself to make changes in the coming weeks to my own professional habits and practices and online (and offline) content. Yes we are only just into the holiday season and as 2008 ends and 2009 begins we face a rather dismal economic outlook around the globe. That said I have a number of personal goals which I have been thinking about (many for well over a decade or more) which 2009 is, I hope, the year I accomplish most of them. So here is a list for me to refer back to over the rest of 2008 and 2009, these are not in any particular order, these are highly personal and all subject to adjustment and changes. I’m not going to rate myself at the end of 2009 by whether I have achieved all of these goals – but I hope to look back on this list with pride. If I remember to – as I accomplish goals in the future I’ll update this post by scratching off that tast and linking to some posts on the subject. Spend around a month or more outside of the United States. A few weeks in Europe (England, France, and hopefully Spain and perhaps elsewhere). One or two weeks in Turkey. Hopefully another trip to India and ideally China, Hong Kong and Japan. I’d also love to get to Africa where I increasingly know people I’d like to visit. Buy an original work of art and hang it in my home. Preferably not from a painter on a street corner (unless his or her work really moves me) but a somewhat serious work that moves me, that I want to have in my homes into the future. I want to start buying art that appeals to me. Turn my own work into art for my home. I’m a serious photographer with my own style and viewpoint. Yet I haven’t printed out a photo of mine in many years. In 2009 I want to print out and hang a large number of my favorite works to share with my guests and enjoy in high resolution myself. Resolve my various dental issues. If you follow me on twitter or if you know me and wonder why I haven’t been at as many events in the past month+ I’ve been getting a lot of dental work (with much more to go). Not fun, definitely not cheap, but around 8-9 months from now (or so) I’ll be much, much happier (if also poorer). Too long delayed, not fun to deal with but well in progress already and will continue throughout 2009. Pay a lot of taxes. Okay this may seem strange – but in order to pay a lot of taxes I have to do one or more things that generate a lot of income (or other – say capital gains – forms of revenue). I look forward to having to pay a lot of taxes – as it means I have earned a lot of money. I’m a bit agnostic as to the sources of this income – indeed my expectation would be that I have multiple streams of income from different efforts – but my goal for 2009 is to have to pay a lot of taxes. End 2009 with nothing of mine in boxes and all the rooms of my home furnished (if never quite finished). I have too many boxes holding too much random detritus of my life. Piles of unsorted papers (in no small part because I don’t have enough file cabinets). Many boxes of books (including a few hundred still at my parent’s home in Illinois). My upstairs is mostly furnished – though there is still a lot I want to change about it (need a standing mirror, some rugs, need to hang art, get a real buffet, wine rack, and china cabinet, etc. My downstairs, however, is horribly unfinished – and my goal is not to end 2009 with it still in that state. Attend an art festival. Could be a film festival which I purchase a full festival pass and just watch tons of films, could be a design or arts festival I fly to, attend (not just the main show but also parties, galleries etc). In short I want to enjoy art & design in a way I haven’t allowed myself for far too many years. Back in Chicago I would attend a few serious art festivals (at least the show) every year. I also made it to many festival screenings – if not usually to the whole festival. Read more books than I buy. Or more accurately work down and put a deep dent into my large stack of books to be read. I seem to buy more books each week than I finish. In 2009 my goal is to catch up a bit on my to-read piles (including editing them down by removing books I’ll never get around to reading). I will certainly continue to buy books (my many friends who keep publishing at a torrid pace will insure that) but I want to catch up the many books I own but haven’t yet read – that loom over my bed as reminders that I haven’t yet read them. Get a massage. And then repeat. The last time I had a massage was many, many months ago – and that was one, short massage at a conference. My shoulder and back are, I’m afraid, more knots than muscles. Best would to again be in a relationship which included massages (though the last time that was the case for me I was also in college – yes that’s depressing, not sure why I’m reminding myself). But this may also be in the category of things worth spending some money upon for my overall health and comfort. Plan ahead more than a few times in the course of the year. This is highly personal and bit complicated to explain. But for nearly two decades I’ve had an aversion to buying tickets to events in advance, to making any type of plan more than a few weeks (heck more often more than a few days) in advance. One large reason is that to attend an event (a concert, a convention, a trip) I’ve wanted to do that with someone else. But having been single for 90%+ of my life I’ve rarely assumed I would have a date to go to any event which I might want to attend. If I bought just one ticket then I’m guaranteeing I can’t go to the event with a date – if I bought two tickets pretty much every single time in my entire life that meant I didn’t end up going at all (and usually the tickets went to waste). I said this was a bit complicated. Working for myself (and not having a lot of income) certainly hasn’t helped either – even when I know there are events I want to attend (SXSW for example) I’ve rarely felt comfortable making plans for them all that in advance. Yes, this in the end probably costs me money (though more often than not it means I don’t end up going to the event at all). Nothing about this is good – and it is intertwined with earning more money (and paying more taxes) and with not being single. But it is also a factor of I need to get over my fear that money will be wasted if I plan in advance in the least. Buy a car. Or less likely (since it is rather inconvienent for me) start using Zipcar. I haven’t owned a car since the end of 2004. In that time I’ve barely driven a car at all (<2000 miles in 4 years total). But not having a car means I don’t do far, far too much. This weekend I’m not in Sonoma with a bunch of my friends who are there celebrating a friend’s birthday and doing wine tastings. In fact I’ve NEVER been to Napa or Sonoma to do the wine tastings (not before I moved here and not since I moved here in 2006). I don’t go across the bay to Marin where my grandfather lives. I don’t drive down to Santa Barbara to visit my grandmother (neither of whom are getting any younger). I rarely if ever go down to Silicon Valley for events or to connect with friends who live there. As much as it pains me, I need to get over my distaste for owning a car and need to buy one. It MUST be an automatic (I refuse to learn to drive stick) and it has to be reliable (I have zero interest in paying much attention at all to maintaining my car – I want to just get the oil changed and tires rotated occasionally). I’m not a car person. But I will need to rejoin the masses of car owners in 2009. And yes, this also hinges on that whole paying more taxes… My tastes are for quality – but don’t need a lot of flash – just reliability and utility as well as comfort when I’m driving (very much for me this means amazing – not just okay – sightlines which are my primary complaint about the majority of current cars I’ve driven, including the Prius which I HATE to drive). Zipcar does not work well for me because I also hate deadlines – and as critically the nearest zipcars are a significant distance from my home. When I drive somewhere I don’t want to have a deadline – I’m not going somewhere for a single purpose – generally I want to be able to change my mind and do a lot of things at once (plus many times when I want to use a car I’ll need to drive pretty far distances). Throw frequent dinner parties. I love to cook and to entertain, in the past year I’ve had many dinner parties at my home. In the upcoming year my hope is to have such parties on more regular basis. For some the focus may be food, for others it may be discussions. I also, equally, want to have many more games nights at my place – get a bunch of friends together (both old and new) and play a bunch of games – board games, role playing games (perhaps) and even the occasional poker night. Hack. I’ve joined Noisebridge which is a new hacker space here in San Francisco. Now, my interest is not in the nefarious forms of hacking – rather I want to stretch myself, break out and use my collection of most issues of Make magazine, remind myself of years ago when I built electronics, install Linux in more of my systems, perhaps build a few new computers, and more. Game. For most of my life I have been a gamer – it has kept my brain sharp. But for the past few years I have played fewer and fewer games. In Chicago I played regular games of chess at the North Beach chess pavilion in the summer and at local cafes the rest of the year. For years I also played LARP (live action role playing games) in Chicago with a large group of friends, even traveling to other states to play the game. Somehow, however, though I’ve long been interested in gaming I have never been a computer gamer or a console gamer. Indeed now I do not even own a TV or monitor on which I might play a console if I were to have one. But professionally and personally in 2009 I want to actually see what I’ve been missing. This means trying both PC (and/or Mac) and probably console games, which may also mean getting a monitor or a projector on which to play them. On the one hand I probably don’t have the time for this, but on the otherhand games like WOW are in many ways the golf for my tech peers, by not playing them, never having ever played it in fact, I am truthfully missing out on a deeper understanding. So that’s a few (okay a lot) of the goals that I have for the upcomming year. I’m sure there are many I’ve missed that at this time in 2009 I’ll look back and wonder why I missed a few big goals and may not weigh all of these goals quite the same (and indeed some of them are far more important to me than others). Family, friends, health all come first. And this is very personal – but I’m curious what you readers have as your goals for next year. Write your own blog post and either link here and/or leave a comment. I look forward to helping you achieve your goals if I can.